Modena enjoyed a rich and illustrious musical heritage from the Renaissance into the 19th century under the patronage of the ruling Este family, yet owing to the close proximity of the city to established centres of instrument making in Brescia and Cremona, its instrument makers have been overshadowed. Like many similar Italian cities, its violin making past is sporadic yet punctuated by gems. The earliest Modenese violin maker of note was Antonio Casini, appointed as instrument maker to the ducal court in the late-17th century, yet a court appointment came with limited prestige. Despite Casini’s considerable skills, during his tenure Duke Francis II d’Este’s patronage was focused on sourcing fine instruments from further afield. He brought decorated Stradivari violins including the 1683 ‘Cipriani Potter’ to the city, and two years later commissioned the Florentine sculptor Michele Antonio Grandini to fashion an extravagant harpsichord out of Carrara Marble. In the century that followed there seems to have been a constant presence of violin making in the city, but a very minor one. In the early 18th century the Terminiani brothers – a priest and a keyboard maker – produced some violins, and one Giovanni Baraldi is recorded as making a cello in 1766, but no examples of his work are known. Andrea Soliani (born in 1752) was the last of these makers, working from the 1770s until his death in 1811. 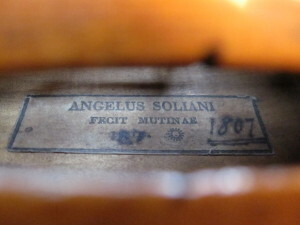 Soliani’s workmanship on the 1807 violin featured here is clean, confident, but fast. The hasty tool skills produced soundholes that lack the finesse of a Cremonese masterpiece, while the purfling shows a certain roughness, with knife marks leading away from the channel. The scroll is accurately carved and fluid in execution, but lacks the finish expected of more careful makers. These economies of workmanship are matched by the selection of wood. Although the back of the violin has an attractive rippling effect, this appears not to be due to attentive wood choice but rather a consequence of using readily available materials. These observations are perhaps more indicative of the economy of violin making at the time, and similar criticism can be levelled at some of the works of G.B. Guadagnini, or late Cremonese makers such as Lorenzo Storioni or the brothers Bergonzi. The violin is based on an Amati model. The soundholes, despite their hurried nature, provide an immediate reference towards the Brothers Amati, but the deeply fluted edges and pinched arching is better associated with the slightly later style of Nicolò or even Stradivari of the 1670s–80s period. The overall architecture of the front and back is extremely well observed and underlines Solani’s competence as a violin maker as well his experience gained from contact with classical Cremonese work.